The train carrying fledglings ran about an hour later than the Red Bank vans. It was a Parcels train that originated at Bradford and called at Mytholmroyd to pick up fledglings that were then conveyed to Rochdale. Other stations also shipped young birds, including Todmorden at one time. In the Lancashire & Yorkshire Railway Magazine No.248, Richard Greenwood provides a photograph of 42616 taking water at Rochdale ready to sprint back to Low Moor. Richard notes that by the summer of 1967 the London Midland Region had already abandoned its tank engine fleet but the Eastern Region were still sending them out on a variety of mail, parcels and early morning mail and passenger turns. There was originally an early evening parcels train worked by Sowerby Bridge loco from Mytholmroyd to Rochdale for the day old chick traffic from Thornbers chicken hatchery. The boxes of chicks were redistributed at Rochdale for further destinations whilst the van was worked forward on the 8.8 p.m. Rochdale to Stoke parcels. Andy Glover on the 'Hebden Bridge Old and New' Facebook page notes that the hatchery was in Hall Bank Lane, Mytholmroyd. He writes that Thornbers used to send day old chicks from Mytholmroyd station, and he has a recording of a interview/ chat with a Mr Allen Parks who was a clerk at Mytholmroyd station before and after WW2. He recalls Thornber Brothers sent chicks via Mytholmroyd station all over the UK. He talks about the 'returns' as well. According to George Hawkins and George Reeve in 'LMS Engine Sheds Volume Three The Lancashire & Yorkshire Railway' Sowerby Bridge loco depot closed on Saturday 4 January 1964, with 4F 44039 being the last loco to be driven away from the shed. At this point the turn was transferred to Bradford, and the Bradford Exchange pilot would then work it. Initially this was an Ivatt 2-6-2 tank, and then latterly until the Eastern Region abandoned steam in October 1967, a Class 4 2-6--4 tank. The train could be just a single four wheeled van, although it needed to have provision for the guard. Pictures have been published. In the Bradford Barton 'Steam on the ex L&Y' page 63 shows Ivatt Class 2 2-6-2T 41250 having just left Summit Tunnel with three vans, two vans with long wheelbases and a bogie van. The rear cover of Tom Heavyside's 'On Lancashire & Yorskshire Lines' shows 42616 leaving the 1,365 yard long Wyke Tunnel en route from Low Moor sidings to Halifax with three empty vans to form the train on 3 July 1967. 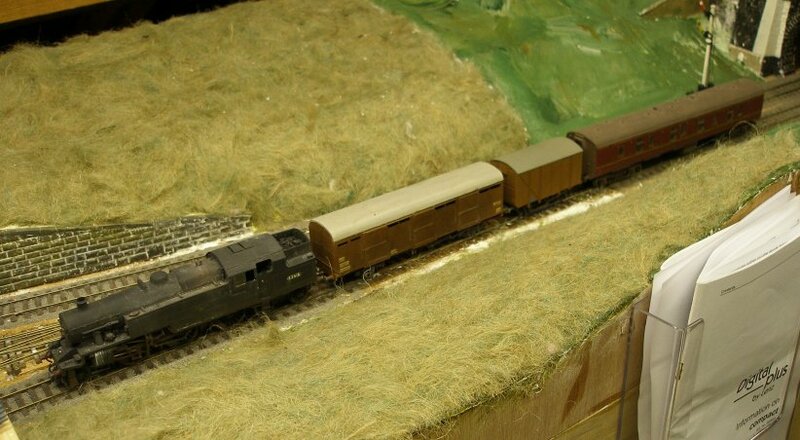 The vans are a BR Mark 1 BG; a LMS bogie van with a guard's compartment and a standard BR 4-wheeled utility van. In the working timetable starting 6 March 1967 it is shown as train 3M05, and is described as the 17:55 Parcels from Halifax, calling at Hebden Bridge at 18:38; Todmorden 18:46; Littleborough 18:48 and arriving Rochdale 19:06. It stood for 20 minutes at Hebden Bridge, arriving there at 18:18. There is also a footnote in the table that this train would depart from Clegg Hall signal box at 19:03 having set down water cans. The cans were picked up by another working. At Rochdale the locomotive came off, took water, and then returned to Low Moor 'light engine'. Photos show up to three vans, but a typical train towards the end could be a single BR Mark 1 BG. Low Moor shed, which was the L&YR deport for Bradford, officially closed on 2 October 1967. Hawkins and Reeve record that the previous day 2-6-4T No 42152 had been in charge of the last steam-hauled train between Leeds and Bradford. Stanier 4MT tank 42616 was the last active member of its class. Whilst it may seem somewhat random, but there does not appear to be a service sheet for the Bachmann Standard Class 4MT Tank 32-354 et al anywhere on the Web, so a copy is provided here. We couldn't locate a photo of 42616 on the fledglings but here is another Eric F Bentley classic with 4MT Stanier 2-6-4T 42616 at Bradford Exchange in 1966. In the foreground is Brush Type 4 D1897 with train 1E55.